A lot of people are astonished when the hear that I sew entire 18th century garments by hand, and mention that they find handsewing hard and intimidating. Here are 5 quick tricks to make it a lot easier – whether you are hand-sewing your own elaborate historical garment, or just sewing on a button or mending a tiny seam. 1. Use good needles (and the right kind). There are different qualities of needles, and different types of needles, and it’s important to have the best quality needles you can afford, and to use the right type the type of sewing and the type of thread you are using. Yes, a packet of good, high-quality needles can cost you up to $9, whereas the bargain store have them for $1, but the last time a student brought in bargain needles to a class of mine we ended up tossing the whole packet because they were all blunt (really blunt. The tip of each was FLAT). You may spend more money initially to buy really good needles, but if you take care of them, they will last much longer, and save you money on needles, fabric, and thread in the long run. 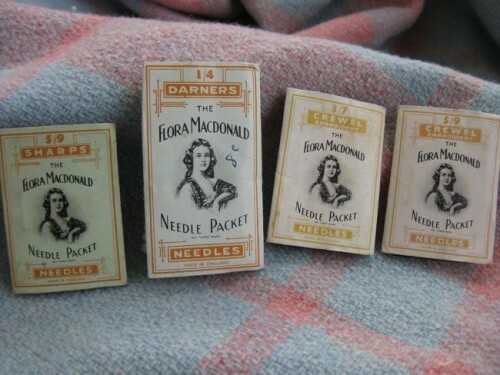 I have a whole stash of beautiful, high quality vintage needles thanks to Nana, but for modern needles J James are great, and Mrs C raves about Piecemakers. A needle with a blunt or snagged tip will catch on your fabric, causing pulls, and it will take you more effort to push it through the fabric. A needle with a ragged or too-small eye will wear and cut at your thread, causing it to fray and break – costing you time, money, and finish on your sewing. Good needles will save you so much time and effort when sewing, and will be much better for your fabric and thread. Use a needle that has an eye just big enough to comfortably hold your thread, without it having to squash through the hole, or without a lot of slipping. A finer, thinner needle will slide through fabric more easily – so generally the finer the better as long as it isn’t squashing the thread. Get a threader if you have trouble threading the needle. Needles do come labeled with their recommended use, but I use that more as a guide than a rule. 2. Use good thread (and the right kind). 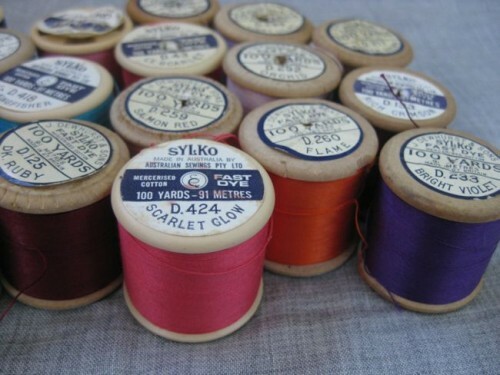 A good quality thread will make a huge difference in the ease and durability of hand sewing. A poor quality thread will be fuzzy and prone to knotting, breakage and fraying as you sew with it, and more likely to break when the item is worn and used. When handsewing (and machine sewing) I use like for like threads: cotton for cotton, linen for linen, silk or fine polyester for silk, polyester for synthetics (though I rarely hand sew synthetics, or hand sew with synthetic thread), and cotton for wool (though I have use strands of wool thread pulled from the fabric itself for some wool sewing, such as my pallas and stola). The type of thread will affect the weight of the thread, but there are also different weights within types of thread: finer for basic sewing, heavy twist for extra strong sewing and buttons. 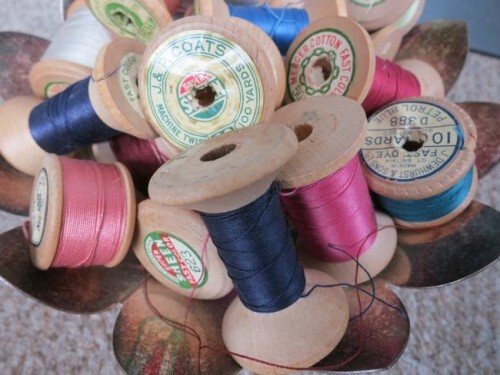 As I have discussed before, I regularly use vintage thread, and find that as long as it was good quality thread to start with, it works every bit as well as new thread of the same quality and type. For modern threads, I like Gutterman and Mettler threads equally. Coats and Clark I find quite inferior. Waxing smoothes down the fluff of your thread, and glosses over the twist, helping it to slide through the fabric more easily. It also keeps the thread from kinking and knotting. It’s particularly important when working with linen and cotton threads. A cake of wax is very cheap (mine was $3.50) and can last for decades. As an added bonus, mine is pretty, and smells like honey, so just picking it up and using it makes me happier. 4. Learn to use a thimble. If you’ve tried using a thimble once you probably found it horrible and awkward, and left off using one. That’s what I did (despite having worked with a traditionally trained tailor and seeing the amazing things he did with a thimble) until I started hand sewing so much that I was regularly wearing holes in the pads of my fingers – and consequently bleeding on my fabric, or wearing holes through my thumbnail from pushing. So, out of desperation I took up thimbles again, persevered until I had learned how to use one, and let me tell you, they are amazing. They protect my fingers from stabs and wear holes, and cut down on arm strain. As with needles and thread, having a good quality one, and the right one for how you sew, is the key. I don’t have any quick answers to what is the right one: for me it was a matter of trial and error, feeling which thimble fit, which I could use to push the needle through best, which protected my finger, and which finger to wear it on. I don’t always wear them on the same finger, and sometimes I sew wearing as many as four thimbles at once. 5. Don’t think you need to know a bunch of fancy stitches! You only need to know 3 stitches (well, 3.5, since there is a forth that is a combination of the first two) to do most historical (pre-sewing machine) hand stitching: the running stitch, the backstitch, and the whipstitch. The most common stitch of all (stitch 3.5) is the running-backstitch – 6 to 10 running stitches, one backstitch, and on you go. It’s stronger than the running stitch, but not as labour intensive as the backstitch. I’m not going to do tutorials because there are dozens on the internet already – you can have fun with google and youtube and find one that makes sense to you. Other than practice, those are the things that I find make hand-sewing fast, easy and angst-free. I hope they help your hand-sewing, and if you have any other tips please do share! As someone that hand sews everything even modern garments I would like to say thank you. I’m always surprised by how many people go stright to machine sewing and fear hand sewing. Its much more relaxing to hand sew and I make less ‘mistakes’ so no seam ripping (I always think that’s a waste of thread. If I can unstitch and rethread my hand stitching I will. Its also faster than people think once I get into a rythum I’m rather speedy. And even the other day I showed someone my stitching and they thoght it was done by machine even though it was hand sewed. Oh what’s your fave handstitch. Mine is the herringbone stitch….both decorative and practical. One of the most annoying forms of ‘member of public’ that I get when reenacting are the ones who not only think my hand-sewing is machine-sewing but are insistent that I’m lying to them when I correct them. I rather like the ones who think it is machine sewing to start with but then get all wide-eyed and go ‘oooo!’ when I tell them it’s not. Best ones are the ones who do that but are old ladies. They actually are a) impressed and b) understand the amount of work. Oh dear. People are so silly. Hand-sewing (no matter how neat) and machine sewing just look so different. Keep a small sample of ‘work in progress’ in your pocket as proof? When you look from the top it looks like a machine..but anyone who’s machine stitched before will see from the underside its hand stitched. I like to think of it as a compliment on my neat stitching. Oh, I like the machine in it’s place, and for its thing, but I think it’s important not to be scared of either! Both have their benefits. Seam ripping is a dreadful waste of thread, but sometimes when I make a mistake handsewing I succumb because unpicking backstitching and running back stitching does my head in. There is a beautiful scene in Five Little Peppers and How They Grew about unpicking basting and carefully re-winding and saving the threads. It really make me think about how precious thread was! My favourite handstitch is the most basic and versatile – the running backstitch. I do love the invisible stitch though. I’m sad enough to keep my thread off cuts which I then use as a ‘needle threader’ then I want to thread embroidery floss. I’ve got suite good now at estimating exactly how much thread is needed for a seam so I only have about a 10cm length left at the end max. Running backstitch is the workhorse of the handsewing world. Do you do what I do when I’m in a hurry about 6 running stiches and one backstich repeated as a pattern? thanks for sharing these tips! I really have to make an effort and try using a thimble again, but as you said, I find it very awkward and feel like I can’t hold my needle correctly. Do try with the thimble – it took about 24 hours of hand sewing for me to get it, but it does make such a difference. I love the relaxed, social aspect of hand-sewing as well. I’ve always been nervous about waxing my thread (especially when working with light-colored fabric). I’ve heard that the wax can melt and stain the fabric – have you ever had a problem with that? I almost mentioned that in the post, but decided to keep it simple. I’ve never had a problem with that, but I don’t wax the threads I use for very light and fine fabrics. If you are worried, I’d just do a test piece. You can also rub your thread with dryer paper which also reduces static cling, making tangling less likely. If you notice wax spots on your fabric, you’re using far too much on your thread. Just run the thread through once and then smooth it with your fingers a couple of times for even distribution. Heavier threads might take two passes of wax. 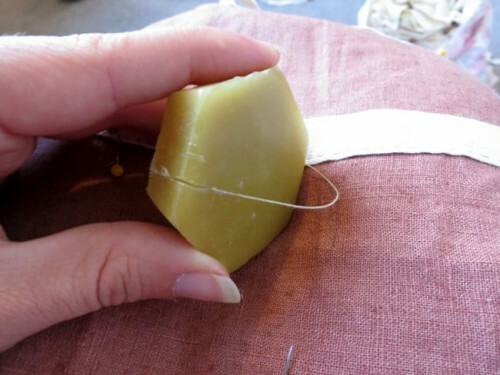 If you’re still worried about extra waxing, fold a piece of scrap fabric around the thread and pull it through a couple of times. The only time I had a problem with wax marking it turned out I’d picked up a piece of cheap beexwax/canning wax blend that had dye added to it. My biggest problem is impatience. I can run up a long seam in 2 minutes flat with a sewing machine but it takes forever with hand sewing. My impatience also causes small stitches at the beginning of the seam an huge stitches at the end. I have no idea how to fix impatience! The trick to fixing impatience is practice! And, like other people have mentioned, using it as a relaxing, social thing. Put a great film on and hand-sew to it. Have friends over to sew with you. Sewing while watching TV is an art in itself. If I’ve got a nice long stright seam I don’t even have to look what I’m doing (only the occasional glance) so I can waatch TV or a film. Panth I entirely agree with you. I’m not the only one? Woohoo! I sit there: *Stitch, stitch, glance. Repeat. 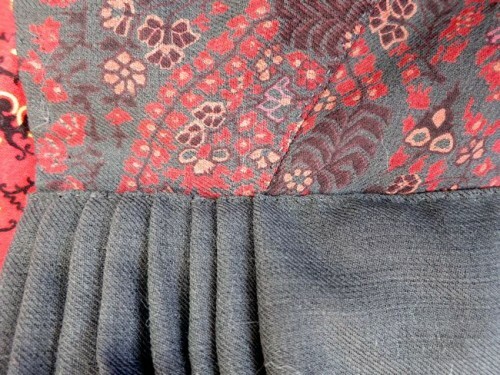 * I don’t see the bother with back stitching an entire seam, though. I’m very meticulous, so I can’t just do a running stitch. I only do that with flat-felled seams, but I work very carefully so that they’re even. Thus, I spend the same amount of time, really. Thank you for the very useful tips. I really need to work on #4, I’ve tried using thimbles and I did find it horrible and awkward. But hand sewing does wear holes in my fingertips, and I’ve got more thimbles than I have fingers (they came with Grandma’s sewing stuff) so I should probably learn to use them. In general I find that hand sewing is much less frustrating than machine sewing. No broken needles, no sewing machine oil randomly appearing on your needle and making giant greasy spots on your fabric, and far fewer giant thread snarls. And it sound like your sewing machine needs a servicing. Machine sewing shouldn’t be any more or less frustrating than hand sewing – my machine never spots, I break needles on it no more often than I do hand sewing (yes, I break or wear out hand sewing needles on a monthly basis – that’s what happens when you do a lot of hand sewing!) and rarely get giant thread snarls (and when I do, it was my fault). With both machine and hand sewing it’s all about learning to work with your equipment. Maybe it does. I’m pretty sure the broken needles were my fault, and the oil running down the needle might mean I haven’t learned to oil it properly. But it does occasionally make giant thread snarls, which are seemingly unprovoked. It’s almost 60 years old, and mostly reliable. I should probably open it up and clean the dust out. Thank you for these pointer. A sewing bird or equivalent is a great help for straight seams & using natural fabrics works best. Where do you buy sewing birds!? I was searching for ages the other day but could only find occasional originals on ebay which were too expensive (for me). Thank you! Everything I found was five times that price or more. You can find a different design if you search for “sewing third hand”, usually for around $10. Yes, I rarely hand sew synthetic fabrics – just not worth the effort, and never looks as nice. I don’t use a sewing bird because I carry my hand sewing around with me and often don’t have a table to clamp on. 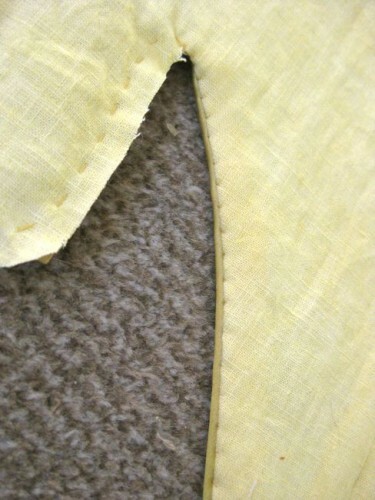 I find that cutting straight edges and practice results in straight seams. I use the low tech equivalent: a pin. I just pin the beginning of my stright seem to my trouser / skirt at my knee (but remember to tuck the fabric of the skirt securly under the knee…..) . Exactly! And hand sewing linen and wool is particularly nice. Also, pressing the seams is just as important with handsewing as it is with machine-sewing. That is, it can be avoided, but the results are usually much neater when you do it. Yes! Pressing is key for all sewing (I need to write a post about that actually…. ). A seamstress I worked with used to say “never trust a seamstress who doesn’t press more than she sews”. 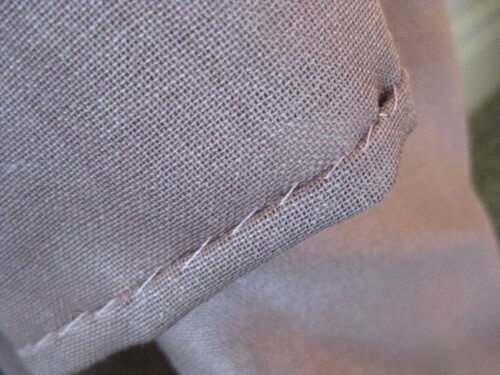 I do find I can sew linen without pressing – it just creases so beautifully with finger pressing. Thank you for the tip about waxing the thread. I’d never thought of that, and it would make such a difference. Thimbles. Sigh. I am a lost cause – I didn’t persevere when I was young, and now feel as if my fingers are wearing thigh-gumboots/waders! Such a shame. I would encourage young seamstresses to grit their teeth and learn the skill. I know how much faster my mother was, using a thimble, than I could ever hope to be. Not to mention the holes and the blood and the muttering. I’m glad I took up thimbles and made myself persevere then! There was a bit of muttering to start with, but now I stitch away with ease. I enjoy handsewing, although I’ve not made a completely hand stitched adult garment yet. I find it’s far easier to make doll clothes by hand, though. It allows me to keep stitching while watching mindless TV with my husband in the evenings. I’m still not converted to a thimble, but I suspect if I start to work with larger garments in heavier fabrics I’ll teach myself to keep one on fairly quickly. A fingertip full of pricked spots is not comfy! Love this 🙂 I used to think I’d never have the patience to sew anything by hand, but once I started making historical costumes the results really speak for themselves. Sadly, the thimble and I never worked it out and now I have a rather large collection on display that mocks me (traditional, half-nail, leather, rubber, etc). thank you for these tips. i still have not taken a sewing class to learn to use my machine, i am soooo intimidated by the machine. what little sewing I do (hemming skirts, fixing rips) is by hand. somehow hand sewing doesn’t scare me (it’s the idea of trying to properly cut and sew a garment that makes me a nervous wreck), the main reason I wanted a machine when i decided i wanted to learn to sew was that i knew at times i might get frustrated with something time consuming and the machine could whip through it quicker. but there is really something that appeals to me about sewing something by hand while watching tv with a cup of tea. an hour ago I did not understand the importance of better needles, I have the cheapies, now I know better. I did not understand the importance of what type of thread to use or about the wax. i always have problems with thread snagging, now i know why. And I really need to learn more than my ghetto variation of the whipstitch. I feel a little less intimdated now. I hand-sew for a living so tend to machine sew my garments. I always hand-sew hems on things like wool skirts or trousers though, they hang much better that way and you can ease the hem more easily too. I think if I was sewing stuff from earlier than the 20th century I’d do more hand sewing though, it would be appropriate to the period. All of my medieval sewing is entirely by hand. I find sewing machines terrifying, but more than that I prefer the ability to sit and chat, drink tea, watch TV, listen to radio, etc. whilst sewing or the ability to take a small project with me somewhere. Having said that, I don’t use a thimble (I need to learn to use my medieval ring one) and you’ve just given me a little wake-up call about making sure my thread diameter and needle diameter match (thanks!). I used to sew back stitch or whip stitch exclusively (for seams/hems, respectively). Now I’m entering into running stitch as it seems to be much more commonly used than back stitch (at least going by the London medieval textiles). I used to have terrible trouble with unintentionally gathering when doing running stitch, but I’m learning not to. Love that you mentioned the social benefits of sewing by hand. I do both (hand/machine), maybe equally but hadn’t reflected on this difference before. Thanks for the tip about how long it takes to get used to using a thimble. I’ve tried before (usually once I’ve created a small crater in one finger), but have given up well before 24 hours. Clearly I need to persevere a lot longer. I can’t agree enough about cheap needles, either. I once bought some where the eyes were prone to splitting at the top. On about the third time that I found myself holding an empty needle I realised what was happening – at that point the whole packet went straight in the bin! Love this post! When people hear that I occasionally sew something by hand, they get all squinty eyed and look at me like I’m nuts. Maybe I was when I first started. I learned to sew by machine, and only hemmed by hand, until I moved overseas and needed a party dress/costume before I’d managed to acquire a machine. A week of frantic experimental sewing later and I was all set. I still have the dress, and feel the urge every so often to practice/improve my sewing so still make some things that way, even though I use my machines more often than not. But given the current heat wave in Melbourne, if I wasn’t hand sewing, I wouldn’t be doing any. It’s the only way I can sit in front of the air conditioner and sew! I take your point about the thimble though – I’ve got some fair calluses on the pads of my fingers from needlework! They always just felt so clumsy whenever I tried them though. The button hole stitch is an essential one too I think! 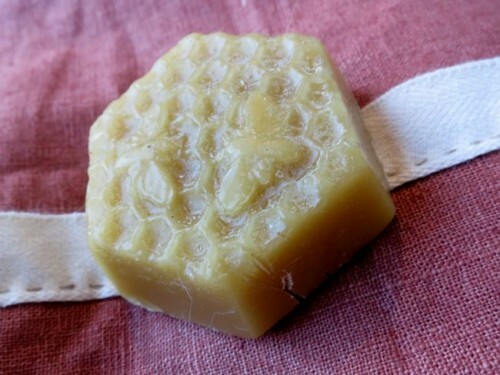 I just bought some beeswax for my hand sewing. I’ve always used good quality needles and thread so I thought I was just rubbish at hand sewing because I am impatient but I can’t believe what a difference using beeswax it makes. Thanks for this post! Super duper helpful and will hopefully make me loathe hand sewing less. Also, I live close to Piecemakers, and that place is an absolute WONDERLAND. They’ve got anything you can imagine, and high quality stuff. They even have trunks of vintage trim and ribbon you can pick through that’s been donated by Piecemakers members! If you’re ever in the SoCal area, definitely check it out. Such a beautiful and charming, friendly place. Now I need to go back there…..
How lovely to read your tutorial and such great information. I spend a lot of time behind a sewing machine and find handsewing so relaxing. I know what you mean about inferior sewing cotton sold today,it can also cause problems with your sewing machines as well. Snagged cottons can drive you crazy!! I have recently begun sewing more often and started fully hand-sewing an 18th-century silk corset. I’ve been fmdimg that one of my most relaxing things to do is to sit in the local library under the skylight and sew, or sew while listening to audiobooks. Librivox has tons of free audiobooks, some of which are great. Oh my goodness, these tips are awesome!! I’ve only been sewing for a few years, I did learn from a friend who did a lot of hand sewing and wool spinning and replica costumes, so she started laying out some great basics for me, but I moved right after I finished my first project with her! Machines and me don’t mix, and I definitely wonder if it’s the type of machine I was trying to use, but I’m just rubbish at it. When I mention to other sewing friends that I prefer hand sewing, I definitely get looks of surprise and disbelief! I just feel like I have more control over the outcome than I do with a machine, even though there are certainly things that would go faster if I knew how to properly use one. I am so glad I found this website. I used to sew withmygrandmother, as a little girl. Then never again until my mid 30’s. My husband bought me a machine that I love but it is in storage in another state. I need some garments made (vests and modest tops) and I don’t want to buy another machine. I am trying by hand. By the way, I really don’t know much about sewing; I just look at tutorials and videos for any projects I’m doing. I need to learn to sew on sleeves (make the sleeve also, lol), scary! I am looking forward to conquring…. I have been looking for instructions on hand sewing forever. So happy to find this!! It’s as if no one knows how to sew anymore without a machine. I used to know a girl years ago who made all of her clothes by hand and you never would know that she didn’t own a sewing machine. Everything looked so professional. I’m disabled now and can’t sit at a machine so had been looking for this. Thanks for posting!! Saving your site to my faves! I used to have lots of tangling problems when I sewed by hand, until someone told me that modern thread is designed for machines, so it’s twisted in the direction that runs smoothest through the machine. When handsewing, I was told, I should thread my handneedle with the end that comes off the roll (same as if threading a machine), and tie my knot on the end I cut. That way the twist of the thread is working with me and not against me. My snarling problems disappeared almost entirely after I started doing that. Question for the thimble-users… where and how does one use it? 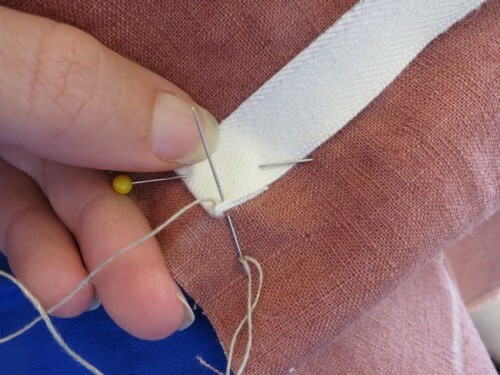 I was told to put it on the middle finger of the dominant hand, and use it to push the needle through the fabric, but I push the needle through the fabric by pinching the eye between thumb and forefinger (to prevent my thread from slipping out), so the thimble would actually make the needle slip from my grip. When I prick myself, it’s usually the pointer finger of the non-dominant hand, but I don’t put a thimble on that because it’s the one finger that needs to be sensitive to the feel of the underside of the fabric, so I can make my stitches even on the underside. Maybe I’m sewing in some idiosyncratic way? People who use thimbles rave about them, and I have lovely old thimbles in my possession, so I’d like to have a use for them! Last time I was hand-sewing a dress, I put on a thimble (dominant hand, middle finger) and tried to use it to push the needle. This was tricky on two counts: first because pushing on the end of the needle was a new technique, and second because the thimble either slipped off the end of the needle, or it worked, but botched my control over stitch length and depth. I felt like someone who’d always worn moccasins putting on hobnailed boots… the sense of connection to the surface under me was gone, and I was clumsy. However, I do think it’s possible to learn to use it effectively. If we use any tool often enough, we start to feel the material “through” the tool. It’s just a matter of practice, I guess. Then I found an interesting rubber thimble, sold at Office Depot as a do-hicky for sorting papers and opening plastic bags. Search for “Swingline Gripeez rubber finger pads” and you’ll see what I mean. It’s blue rubber, kinda thick, with a raised edge around the tip. It’s a lot sturdier than the floppy flesh-colored ones that people often use for sorting papers. It’s not marketed as a thimble at all, but since it fit so nicely on my middle finger, I thought I’d give it a try. It is helpful for gripping slippery needles when working with thick fabrics, and it has that nice raised edge to serve as a brace when occasionally I do have to push the needle through several stubborn layers. I wonder if that’s how Erika W uses leather thimbles; I imagine that leather would work just as well as rubber for gripping and pulling needles though tough material. I am surprised that nobody here has mentioned leather thimbles. I have used them for years. My grandfather- in – law was a shoemaker and he gave me my first one. They are wonderful to use. I am very glad to find this website and enjoyed reading all the comments. I enjoy embroidery by hand, find it very relaxing, and as others, said, can do it while my husband is watching TV or a movie. When I think of machines doing embroidery, I think what is the point? You might as well have a water colour machine, put your fine paper and colours in, pull it out and say, I’ve done a watercolour. My mother made quilts completely by hand. I have made clothes with the machine before and I hated it! I had started thinking, I would probably enjoy sewing if I could do it by hand, like the embroidery. I also saw a film “Bright Star” about the poet John Keats. lady friend who designed and made all her clothes by hand, and that was inspiring. I believe I will start with a skirt. And also try to find some leather thimbles. My grandmother and mother both used the metal thimbles, but I have not been successful with them, but I will try the leather ones. Thanks for all the tips. As I stated earlier, when I embroidery by hand it is relaxing, when I sew with the machine, I feel like I’m in Algebra class. I wondered if there were others that felt the same as I do, went to Google, and found out, Yes! Although I realize the “dreamstress” doesn’t hate the machine, some of you made comments that you did. I love hand sewing but don’t typically make garments. I have some thread conditioner in a little blue plastic box that I use quite often. Could you share which type of thimble is your goto tool? I have tried them all and ditched them all. I haven’t altered a wedding dress that hasn’t carried a bit of a DNA sample down the aisle! I have a quilt I am ready to pick back up that will be all hand done. My problem with thimbles, besides the awkwardness, is that I can’t feel when the needle is through the fabric without the prick of my finger to tell me it has arrived. So I would need one top and under seam. Sigh.